UN Special Envoy for Libya, Martin Kobler, told the UN Security Council that this year should be the “year of decisions and political breakthrough” for the North African country that has been marred with chaos since 2011. The GNA is backed by the UN but it has very limited influence on the ground. The GNA is also weakened by the divisions in the Presidential Council (PC), its leadership body, with its nine members prone to making contradictory statements. Two of its members have been boycotting proceedings. 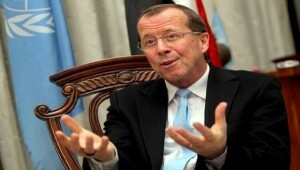 According to Kobler, there has been an improvement because of a “growing consensus to adapt” its composition. PC’s members represent the different geographical regions and political currents in the country. Also, voices are rising that Field Marshall Khalifa Haftar “must have a role” in a unified Libyan army and there are expectations that Russia will facilitate communication with him. Haftar is loyal to the Tobruk-based House of Representatives that must approve the Libyan Political Agreement in order to make the GNA legitimate. Following the successful ousting of the Islamic State in Sirte, concerns still remain over the country’s porous borders because terrorists, human and weapons traffickers, and criminal gangs could continue to exploit the security vacuum. Written by: Jaber Ali on February 9, 2017. Posted by Jaber Ali on Feb 9 2017. Filed under Headlines, World News. You can follow any responses to this entry through the RSS 2.0. Both comments and pings are currently closed.